Last weekend, the weather was perfect, so you decided to go to Cherry Hill Park. When you got there, you saw that half of Falls Church was at the park, too! In addition to all the people on the playground, there were a total of 13 kids riding bicycles and tricycles. 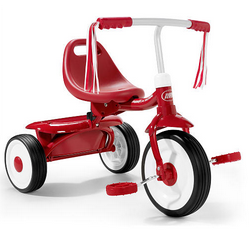 If the total number of wheels was 30, how many tricycles were there? First, some comments about the problem. I dislike using “you” in math problems. I believe it’s a turn-off to students who can’t see themselves in the situation described. There are enough reasons that kids don’t like math. Why give them another reason to shut down by telling them that they went somewhere they didn’t want to go or that they did something they didn’t want to do? Word problems are not real-world just because they use a local context, and this one is no exception. This problem attempts to show an application for a system of linear equations, but true real-world problems don’t have all the information neatly packaged like this. Wouldn’t the person posing this problem already have access to the information they seek? That is, if she counted the number of kids riding bikes and the total number of wheels, couldn’t she have just counted the number of bicycles and tricycles instead? It has always struck me as strange when the (implied) narrator of a math problem wants you to figure out something they already know. All that said, this was meant to be a fun puzzle for a summer contest, and I don’t mean to scold the library. 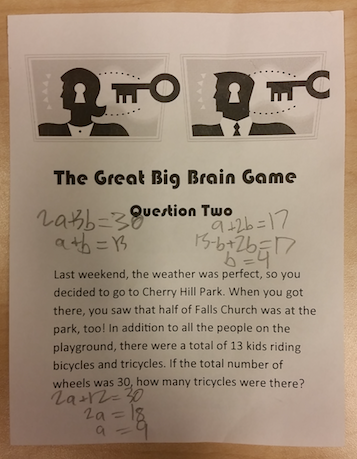 I don’t know that I’d use this puzzle in a classroom — at least, not presented exactly like this — but I love that kids in my town have an opportunity to do some math in June, July, and August. Imagine that all 13 kids were on bicycles with 2 wheels. That would be a total of 26 wheels. But since 30 wheels are needed, there are 4 extra wheels. If you add each of those extra wheels to a bicycle, that’ll create 4 tricycles, leaving 9 bicycles. So, there must have been 4 tricycles at Cherry Hill Park. That’s all well and good. In fact, it’s perfect if you want to assess my son’s ability to translate a problem and solve a system of equations. But I have to admit, I was a little disappointed. What bums me out is that he went straight to a symbolic algorithm instead of considering alternatives. A key trait of effective problem solvers is flexibility. That type of flexibility comes from solving many problems and filling your toolbox with a variety of strategies. My worry — and this isn’t just a concern for my son, but for every math student in the country — is that students learn algorithms at the expense of more useful problem-solving heuristics. What happens when my son is presented with a problem that can’t be translated into a system of linear equations? Will he know what to do when he doesn’t know what to do? The previous pull-out teacher said that when she presented my sons with problems that they didn’t know how to solve, their eyes would light up. They liked the challenge of doing something they hadn’t done before. I’m hopeful that this enthusiasm isn’t lost as they proceed to higher levels of mathematics. I love to create math games almost as much as I love to play them. My favorite professional project was leading the development of Calculation Nation. And my favorite game on the site is neXtu, though other games on the site may promote more sophisticated mathematical thinking. Recently, I’ve been frustrated by the lack of games for teaching algebra. I’ll give props to the good folks at Dragonbox, which uses a game environment to teach algebra. But I’m not yet convinced that it leads to deep algebraic understanding; even they admit “to transfer to pencil and paper, children must be explained how to rewrite equations line by line.” They also claim that “in-house preliminary tests indicate a very high level of transfer to pencil and paper,” but that’s the fox watching the henhouse. The game mechanics depend on mathematics. The math is not tangential to the game; it is the game. Kids don’t realize (or at least they don’t care) that it’s a math game, because it’s fun. It pains me to write that second criterion, because math is fun. But I know not everyone shares that opinion. So I do my best to disguise any math learning in the game and then, when they least expect it — BOOM! — I drop the bomb and show them what they’ve learned. So here’s a game I recently devised. Player A chooses a number. Player B chooses two operations for Player A to perform on the number. Player A performs those operations and then tells the result to Player B. Player B then tries to identify Player A’s number. These rules leave something to be desired, since Player B could simply ask A to “multiply by 1” and then “add 0,” in which case finding A’s number would involve no work whatsoever. To be a stickler, an additional rule could impose that either addition or subtraction can be used exactly once and that no operation can involve either 0 or 1. In a middle school classroom, I suppose I would state such a rule explicitly; for playing this game with my seven-year-old sons, I opted not to. I thought of a number (14). Eli asked me to add 3 to my number. Alex asked me to multiply by 3. I told them the result: 51. Eli then guessed that my number was 16. He had subtracted 3, then divided by 3. Eli then realized that my number was 14. Wow, I thought. This is going even better than I hoped. Grace Kelemanik once said that she knew she was being effective when she didn’t have to say a word. She’d watch from the back of the room as students carried the conversation and guided one another to correct mathematical thinking. I will never claim to be half the educator that Grace Kelemanik is. But yesterday morning, I was pretty darn effective. I’d love to hear about math games you’ve played with kids, whether you invented them or not. 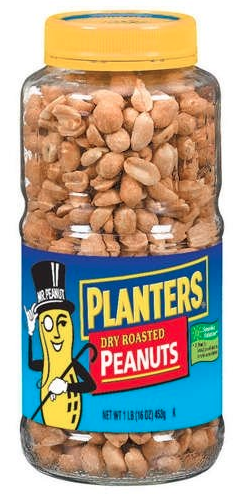 When we recently bought honey roasted peanuts at the grocery store, Eli speculated that there were 215 peanuts in the jar. “Okay, so now we have to count them,” Eli said. “No,” I said, explaining that I didn’t want them touching food that others would be eating. I then showed them the back of the jar, which said that one serving contained about 39 pieces and the whole jar contained about 16 servings. They knew that 39 × 16 would approximate the number of pieces, and they estimated that the jar contained 40 × 15 = 600 pieces. But then they wanted the actual value, and I wondered how we could use the estimate to find the exact product. More importantly, I wondered if it was possible to find an algorithm that would allow an easily calculated estimate to be converted to the exact value with some minor corrections. My sons’ estimate used one more than the larger factor and one less than the smaller factor; that is, they found (m + 1) × (n – 1) to estimate the value of mn. A little algebra should help to help to provide some insight. Find an estimate with nice numbers. This gives 600 + 1 + 39 – 16 = 624. And sure enough, 39 × 16 = 624. So if you want to find the product 41 × 14, then the larger factor is one more than 40 and the smaller factor is one less than 15. The estimate is again 40 × 15 = 600. Then 600 + 1 – 41 + 14 = 574. And sure enough, 41 × 14 = 574. The same idea can be extended to numbers that aren’t the same distance from nice numbers. But that’s not the point. The intent was not to find general methods for every combination; instead, the hope was to use an easily calculated estimate as the basis for an exact calculation. I’m not sure this method completely succeeds, but it was fun for an afternoon of mental gymnastics. Think! Think and wonder. Wonder and think. How much water can 55 elephants drink? These are the things about which I think and wonder. Ever wonder why pizza is circular, delivered in a square box, and served in triangular slices? Weird. Ever wonder why textbook authors write problems about people who buy 58 dozen eggs at the grocery store? Or why their editors don’t edit them? How Much Does Your Name Cost? The price of a name is equal to the sum of the prices of its letters. The price for uppercase and lowercase letters is the same, and there is no additional surcharge or tax. How much would the following people pay to buy the letters in their names? Those of you who know a little algebra will have no trouble with that problem. Those of you who don’t shouldn’t have too much trouble, either. But then, I realized I could extend the problem for some added fun. And who am I to keep fun things to myself? So, here ya go. The store didn’t have a list of prices for the individual letters, but then I realized that I didn’t need one. From the table above, I could figure out how much my name would cost. Can you figure out how much your name would cost? And while I don’t believe in answer keys, you can check your work by using the form found on this page. Got a bead of sweat running down your forehead as you frantically race to complete your 1040? Here are a few math finance jokes to relieve the stress. Financial Trigonometry: If someone asks you to cosine, don’t sine! Instead, go off on a tangent! That’ll save you $40,000! Financial Algebra: My wife leaves Houston at 8:39 a.m. on a plane bound for Albuquerque. She arrives at 9:42 a.m. and spends the next three days at a hotel with my best man. If she then decides to leave me for him, how long will it take me to pay off the Visa bill from this trip of infidelity, assuming an annual percentage rate of 18.5%? Financial Formula: Easiest way to determine your cost of living? Take your income, then add 10%. “What are we doing today?” the tattooist asked. 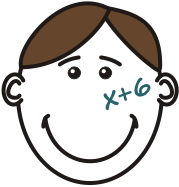 “How about x + 6 across my left cheek?” A blank stare. “You know, like from algebra,” I explained. I got the sense he wanted to ask some follow-up questions… but then decided against it. Instead, he started inking. Twenty minutes later, he held up a mirror so I could see his handiwork. “You don’t like it, do you?” he asked.